So I thought I would start a series for my outfit posts on here. 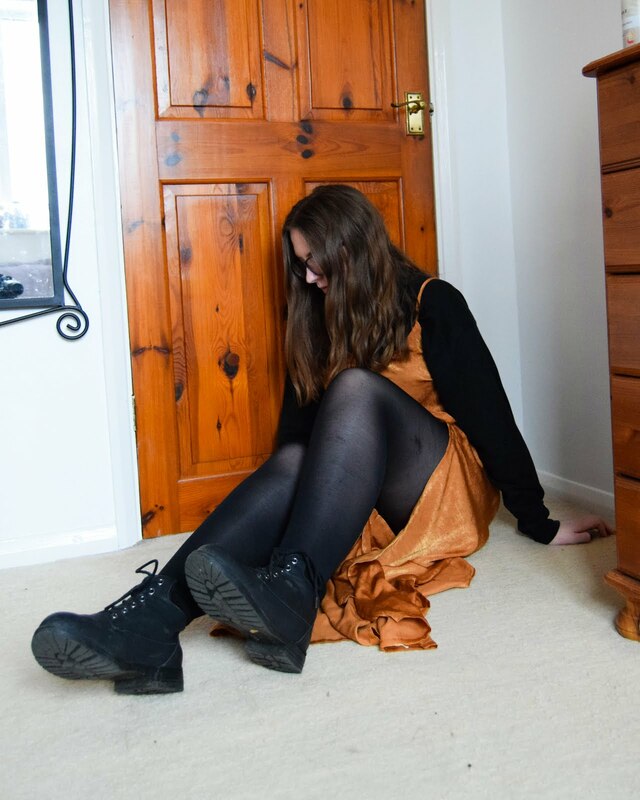 I haven't really been up to much this last month apart from college and a birthday meal but I still thought I could grab a few snaps to make up an outfit post. I'm actually so stuck with how to start this post I think I've re-written this intro about 50 times (well it feels like it) so lets get out of this terrible start and get into the photos, which I'm sure everyone would prefer to see. So lets start with outfit number 1. I would link all the items I'm wearing but I don't know if they still sell them *-*. I've worn this outfit so much over the last month. It has been one of my go to outfits for college. I mentioned the jacket in my October Favourites and to be honest I've pretty much worn it to college everyday, not only because my only other warm coat is a blue parka the same colour as my jeans but I just am kind of obsessed with it. The outfit as a whole is overall comfy, one box off the check list tickets, but it also makes me feel like I'm at least a little bit dressed up for going out the house, ticking another box. And again I'm wearing the green jacket in outfit number 2, is my liking for it showing yet? This outfit is what I wore to a birthday meal that I went to the other weekend. It was kind of a chilled meal but with the turtle neck I sort of felt a bit more dressed up (does that even make sense). The turtle neck top was actually one of my mum's old ones, but I've made claims to it rather than buying myself a new turtle neck top, as she never wore it anyway. This one isn't too tight and the long sleeves, though you can't see from the photo, are cuffed at the end which I love, and they're long enough to pull over my hands which is a necessity for me when wearing long sleeves. Apart from that the outfit is pretty much the same, though the jeans are a bootleg cut rather than a straight like in outfit 1. I should really learn where some of my clothes are from it isn't very helpful not knowing when trying to blog. Anyway outfit 3 if kind of a lazy day throw together. Even though I spent the day at home studying I wasn't feeling the baggy jumper and leggings (though I do love them other days) and wanted to dress up just a little and I guess this is what I came up with. The denim top is actually one of those flannel kind of tops that I tend to chuck on top of a vest top but on this day I felt like doing something different so grabbed this crop jumper and put it over the top. It was actually an experiment outfit because I didn't know if it would work but I have to say after it I actually quite like it. Okay I'm staring at the last picture and you can see where I would usually wear my watch as it's paler, I am sorry for that ^_^. Going back to the last photo I love rolling up my sleeves to make them sort of 3/4 length, though I do like hiding my hands in my sleeves having them pushed up my arm means I'm able to do work but don't have to get to cold as if I'm wearing a shirt sleeve top. And I totally just waffled on about nonsense there whoops. Anyway that is just three of the outfits I wore this month. I'm thinking of keeping this as a series on this blog, if you enjoyed it let me know so I can keep it up for December. Oh my goodness, it's December that hasn't really sunk it yet! I don't think I'm ready for 2015 to be over yet, only last month I nearly wrote 2013 when I was in maths, ooppps! So over to you, Which of these is your favourite look? Oh and what Christmas posts would you guys like to see? I've got some ideas but I don't know if there is enough.